UK readers can kick off a PC Gamer subscription at an amazing price. Subscribe to PC Gamer in our Spring sale, and you can get five issues of the magazine, print or digital, sent to your door or device for just £5. This is a UK-only offer, and it's a great way to kick off your subscription to our long-running magazine. We've been going for over 25 years, and we still bring the best reviews, previews, features and hardware coverage to your door. Each month, you'll get subscriber-only covers through the post, as well as a digital code. For this current issue, for example, we gave our UK readers a DLC code for Vermintide 2 worth £7. Interested in this deal? 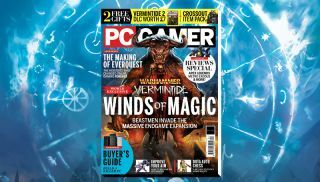 Just head to the subscription page to start getting PC Gamer every month.